The saga continues. After informing us in September that the IAC-owned Bloglines was to be shut down permanently, Ask.com (the IAC property that operates Bloglines) has resurrected the troubled RSS feeder, the company tells TechCrunch exclusively. IAC has transferred ownership of the property to an unlikely new patron: MerchantCircle, an online marketing network for small business owners. Financial terms of the deal were not disclosed but we do know that the deal was sort of in the family—IAC invested in MerchantCircle back in 2007. 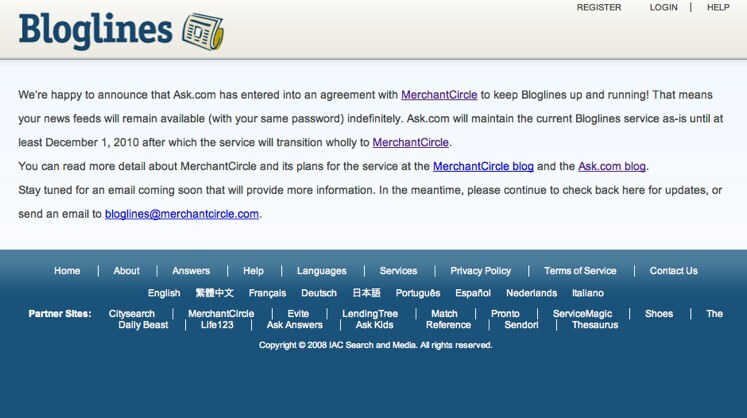 We are told Ask.com will maintain the current Bloglines service until December 1 of this year, after which the service will be transitioned to MerchantCircle. IAC and Ask.com put Bloglines out of its misery after a tumultuous history. Bought by IAC’s Ask.com in February 2005 for around $10 million, the site has been in trouble, facing competition from Google Reader and a shift away RSS to realtime news streams. While we heard IAC was looking for ways to either refurbish, or sell Bloglines, it looks like they finally got around to the latter. But MerchantCircle is a surprising candidate considering that it is not a media property. MerchantCircle, which has been quietly snapping up companies, provides a business directory for merchants in smaller towns and currently lists 1.4 million small businesses. The startup has long targeted merchants in small locales versus catering towards the consumers, as sites like Yelp and CitySearch do. MerchantCircle has local business members in 95% of the 24,600 U.S. cities and towns with populations over 200. And the company could be eyeing an IPO in the coming year. Ben Smith, co-founder of MerchantCircle, says he has big plans for Bloglines. The technology will be integrated into MerchantCircle to allow business owners to create RSS feeds on local news around their town, or city as well as their specific trade (i.e. feeds around plumbing, law, or construction). Smith says the platform will also be able to bring in feeds of local daily deals and coupons. 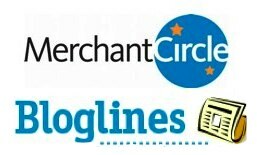 As you may have heard, Ask.com has entered into an agreement with MerchantCircle who has agreed to keep Bloglines up and running. Stay tuned over the coming months as MerchantCircle works to improve the Bloglines service by creating a richer and more local user experience. In the near term, your news feeds and access to the service (with your same password) are still available. You can read more detail about MerchantCircle and its plans for the service at the MerchantCircle blog. Timing: Ask.com will maintain the current Bloglines service as is until December 1, 2010. After December 1, 2010, the service will transition wholly to MerchantCircle. During the month of December, you will be able to easily port your feeds over to the MerchantCircle-powered service. It’s an easy process, and we’ll provide you with complete instructions well in advance. Logging-In: You will keep your same password as before.